Registration for the sixth international IASPR conference in Salt Lake City is now open! Registration is available for three days or single days, and there are special rates for students and independent scholars. The conference will take place from June 23-25, 2016 on the University of Utah campus. IASPR is pleased to announce that we will hold our sixth international conference in Salt Lake City, Utah, USA in June of 2016. The Call for Papers is now available for individual papers, full panels, roundtables, interviews, or innovative presentations. The deadline for proposals is October 9, 2015! Issue 4.2 of the peer-reviewed Journal of Popular Romance Studies is available free on-line. It features a special issue on The Popular Culture of Romantic Love in Australia, guest edited by Hsu-Ming Teo, with pieces on material culture, mass-market fiction (for men and women), and Australian film, and an interview with award-winning Australian romance novelist Anne Gracie. Two new pieces on teaching romance novels at the university level round out the issue, along with the text of the Popular Culture Association’s 30th Anniversary Roundtable discussions of Janice Radway’s Reading the Romance and five new book reviews. Our next issue will appear this summer, and we welcome submissions on romantic love and its representations in global popular culture, now and in the past. For information on current topics of interest and submissions guidelines, visit http://jprstudies.org/submissions/topics-of-interest. Friend us on Facebook and follow us on Twitter! working closely with the Executive Editor in the daily management and further development of the Journal. The ideal candidate has a PhD (in any field; late stage doctoral students will also be considered), knows the field of popular romance studies (or is willing to become familiar with it) and/or has an interest in academic publishing. We are looking for someone who is flexible, enthusiastic, and discreet, since the Managing Editor will be in possession of confidential information about the status of manuscripts, the names of peer reviewers, etc. This is a volunteer position – there is no salary connected to it. However, it affords ample opportunity to develop transferable skills, gain experience in publishing, network with scholars around the world, and contribute to the further institutional and scholarly recognition of the field of popular romance studies. If you are interested, please send a letter of motivation and a brief CV to Eric Selinger (Executive Editor) and An Goris (Managing Editor) at managing.editor@jprstudies.org no later than September 1 2014. Questions may also be sent to this address. We are excited to announce that IASPR has published its schedule for the upcoming conference in Thessaloniki, Greece, June 19-21, 2014. Please see the schedule page for more details! There have been a few exciting updates for our 2014 conference in Thessaloniki, Greece. Our keynote speaker is Deborah Jermyn, who will be giving a talk entitled The New Romantics? : Meryl Streep, contemporary romcom and the ‘graying’ of Hollywood cinema. Hsu-Ming Teo will be giving a plenary speech on her recent book, Desert Passions: Orientalism and Romance Novels. If you haven’t done so yet, please check out our Call for Proposals. We hope to see you there! IASPR / JPRS in the News! four major components: a Web site developed by the Roy Rosenzweig Center for History and New Media, at George Mason University; a conference planned for Valentine’s Day 2015 at the Library of Congress’s Center for the Book; a nationwide series of library events sponsored by the American Library Association; and a documentary film, Love Between the Covers, being shot by Laurie Kahn, whose previous work includes the well-received documentaries Tupperware! and A Midwife’s Tale. Several members of IASPR / JPRS are scholarly advisors for the Popular Romance Project, including our founder, Sarah S. G. Frantz, our current president, Pamela Regis, and our journal editor, Eric Selinger, who also edits the “Talking About Romance” blog at the Popular Romance Project’s website. We are happy to announce that Pamela Regis, formerly the Vice President of IASPR, will be assuming the Presidency of the organization. She is joined by two new officers as Vice-Presidents, An Goris and Jayashree Kamble, and by Chryssa Sharp as Treasurer. The Conference Chairs for our upcoming international conferences will be Betty Kaklamanidou (2014, Thessaloniki), Crystal Goldman (2016, San Jose), and Margaret Toscano (2018, Salt Lake City); in the interim years, IASPR will work with other organizations to foster scholarly panels and presentations on popular romance media at national and international gatherings sponsored by other organizations. We thank Sarah for her vision and guidance, and we look forward to announcing more additions to the roster of IASPR board members and officers in the weeks to come. 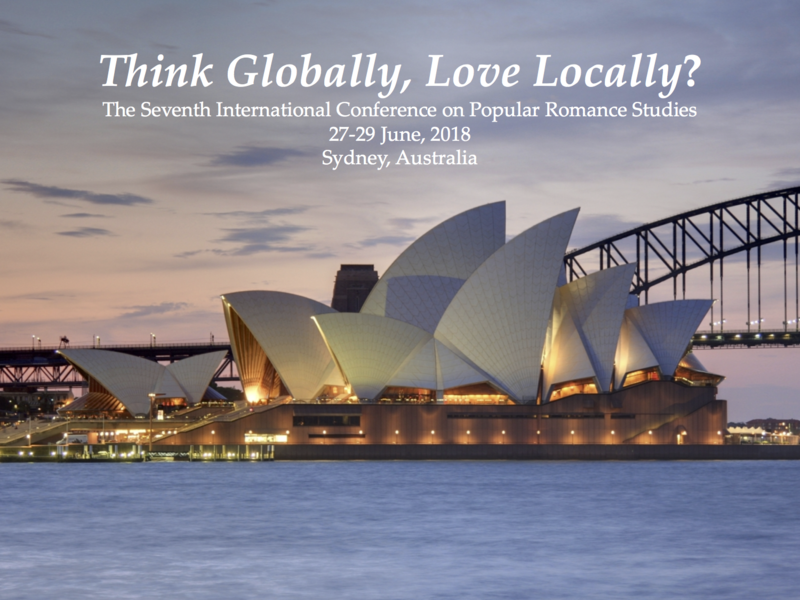 The Fifth International Conference on Popular Romance Studies will focus on the romantic love and its representations in popular media, now and in the past, from anywhere in the world. It will be held at Aristotle University in Thessaloniki, Greece, 19-21 June, 2014. We are interested in scholarship on all forms of popular media: not just fictional modes (novels, films, TV shows, comics, song lyrics, fan fiction, etc. ), but also didactic genres (advice columns, dating manuals, newspaper debates about love or marriage “in crisis”), depictions of real-life love, and the representations of love, romance, and material culture deployed by advertising (wedding dresses, courtship rituals, etc.). Please submit your proposals for individual papers, full panels, roundtables, interviews, or innovative presentations for peer-review consideration to conferences@iaspr.org by November 15, 2013. See the official Call for Proposals for more details.